Watch out Basildon – Virgin Media are in town, promoting their latest deals in the town centre. To find out more about high street trailer campaigns from TCM, call Lindsey on 01543 255452. Following another successful LAMMA show, we can’t believe just how much of Peterborough showground has come back to the Midlands with our trailers. It’s a good job we like cleaning! If LAMMA has got you thinking about exhibiting at agricultural and county shows this year, call Lindsey on 01543 255452 to find out more about exhibition and show trailer hire from TCM. If you are exhibiting at The Agricultural Machinery & Equipment Show on 12 February 2014 at the Showground, Shepton Mallet, we still have some availability on 5m and 6m exhibition trailer hire. So if LAMMA whets your appetite for a winter show call Lindsey on 01543 255452 and don’t forget to order a couple of patio heaters as well! Off to British Potato 2013! Good luck to all exhibitors at British Potato 2013 at the Great Yorkshire Showground at Harrogate this week, particularly our new clients R J Herbert who have both indoor and outdoor stands showcasing their machinery. For more information on exhibition trailer hire from TCM for agricultural events throughout the year, call Lindsey on 01543 255452. Hit your health assessment targets with TCM Trailers! One of our lovely Health Improvement clients reported that they completed two months’ worth of health assessments in one week during a recent health lifestyles roadshow in London. To find out how TCM Trailers can help you hit your targets and get out into your local community, call Lindsey on 01543 255452. Solar powered trailers hit the road! TCM Trailers are currently working on a trial for solar powered trailers in response to customer and venue concerns about using generators in public settings. Solar powered trailers can provide internal lighting and sockets to power mobile phones and laptops, so watch this space for a roll-out across our high street trailers. 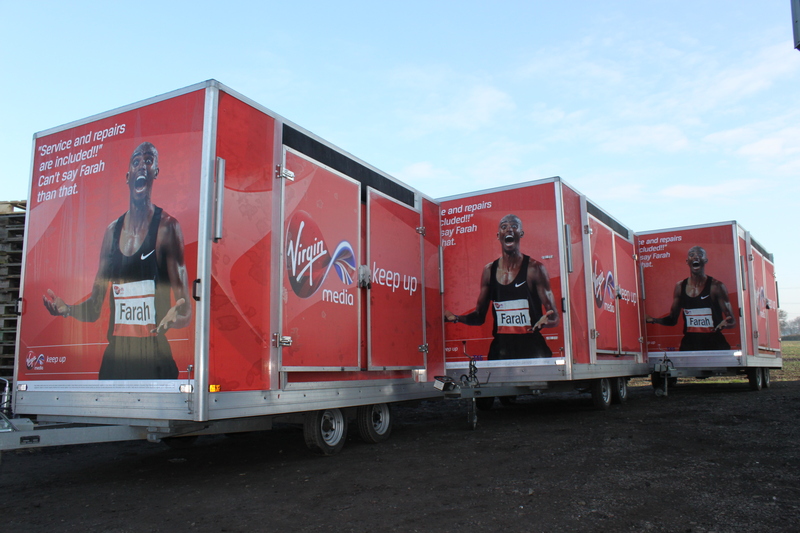 To find out more about high street trailer campaigns, call Lindsey on 01543 255452. 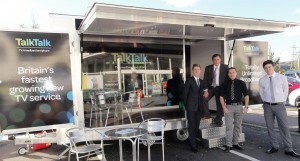 Talk Talk’s current trailer campaign is working across England, Wales and Scotland giving new customers information about their latest TV, broadband and phone services. 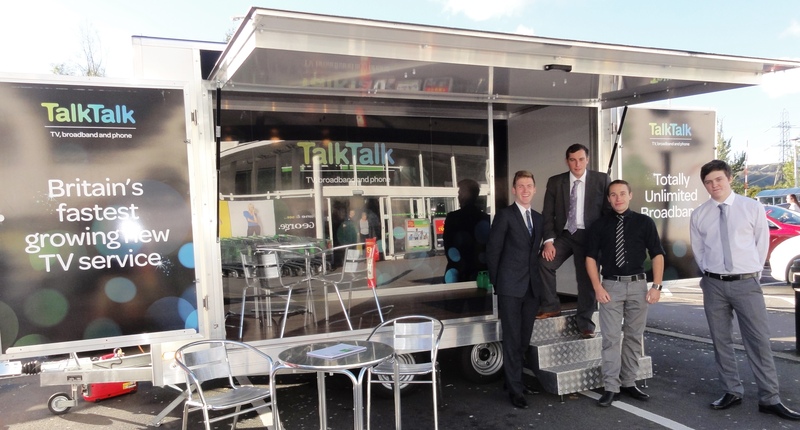 We met up with the team in Cardiff this week – so watch out for a Talk Talk trailer on a high street near you! For further information on high street customer acquisition campaigns from TCM Trailers, call Lindsey on 01543 255452. Ignore the weather and look forward to next year! If the miserable autumn weather is getting you down, tick off a job for next year and plan your summer roadshows with TCM Trailers. We offer a range of trailers from 4m to 6.5m and can also book the venues, sort out the wifi and even help with staff if required. Call Lindsey on 01543 255452 for more information about roadshow trailers from TCM. TCM this week welcome back Virgin Media with a new high street trailer campaign. Check out the latest deals on a Virgin Media trailer near you! For further information about high street trailers and customer acquisition campaigns from TCM, call Lindsey on 01543 255452. 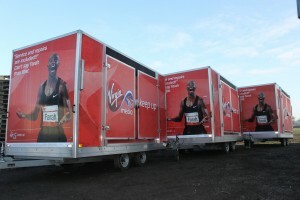 If you are planning a No Smoking Day 2013 promotion and are looking for exhibition trailer hire, we have limited availability already, so call us soon on 01543 255452 to avoid disapointment! Our trailers can be used for social marketing, roadshows or drop-in Stop Smoking clinics, and we can also provide promotional staff!